I participate occasionally in two groups: The Maine Traditional Film Photography Club and the Kennebec Valley Art Association. In 2012, they presented a show of photographs to commemorate Woody Guthrie’s one hundredth birthday. I was reluctant to participate, and I received some pressure. Perhaps they had a genuine belief that my photographs would add to the show. I suspect the pressure was because it looked at first like there would be few submissions. I was reluctant because each submission had to be accompanied by a statement citing a Woody Guthrie song and how the photograph interpreted it. I believe it is almost always a misguided effort to use one’s own art to interpret someone else’s art. If Woody Guthrie thought that photography was the best way to communicate whatever he had in mind, then he would have been a photographer. Anyone who wants to experience Woody Guthrie should listen to his music. Also, I doubted whether I could create any suitable new photographs in time for the show, and I did not see how any of my existing photographs could be called an interpretation of one of his songs. After all, I was not humming his songs when I exposed any of my existing negatives. Eventually I succumbed and submitted “Eight Miles West” and two others. (I am not going to say which two, because I do not think of them as interpretations of his songs, and I do not want you to either.) Here is the statement I submitted with it. “Song Long, Its Been Good to Know Yuh”, “Hard Travelin’”, and “Oregon Trail” are just some of the songs Woody wrote about traveling. In his songs, some people traveled to find a job or because the farm had failed. Some simply wandered because that was their nature. 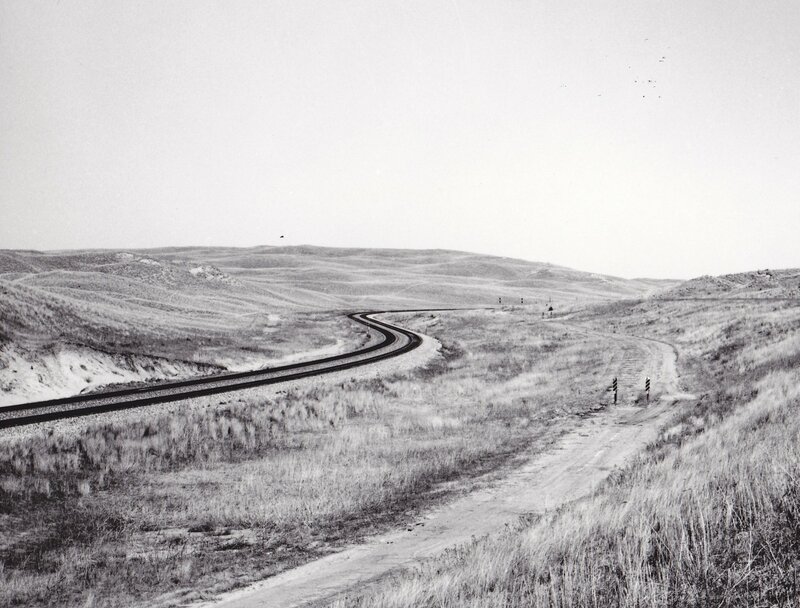 My photograph shows some of the paths taken by people: a railway, a wagon trail, and a highway reaching across the Nebraska prairie and vanishing around a hill. What’s waiting on the other side of that hill, around the curve? Is it just more “endless skyway”?